MX-Clocky 16.3.1 is now in the test repository. 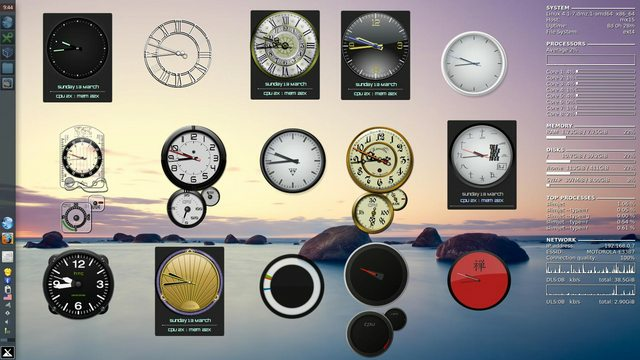 Clocky is a desktop analog clock which uses python, and consumes much less CPU than cairo-clock. It can also display CPU and RAM use--in my screenshot below, replace the x after those numbers with %. 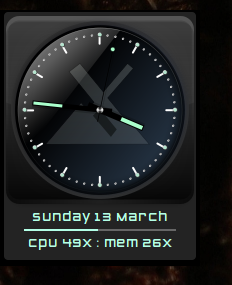 It also has a bar between that's displaying the CPU usage below the date. What you have to do after install is go into /usr/share/clocky/skins and run the INSTALL.sh script for the skin you want to use. You can also copy the skins folder over to somewhere in your home folder and run the install scripts from there; that makes the skins much easier to tinker with, like renaming the skin.py file for my skin to just have the clock. 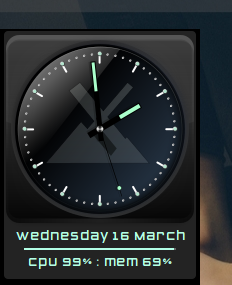 After the setup, it's under Accessories in Whisker menu and Utilities in KDE as MX-Clocky. You have to add it to the autostart apps in xfce in order for it to run, but KDE will remember it if you are having KDE restore the last session. Clocky looks best with compositing on, but my grey rectangle mostly hides the black square when it's off. I also noticed some quirkiness in clicking it and changing a config setting, in that I had to do that twice to get it to stick, and then reload. It also seems to work best when stick to desktop is enabled; it can still be moved around by holding down the Alt key and dragging with the mouse, like all applications. Is the X in CPU and Mem %? richb wrote: Is the X in CPU and Mem %? Yes, "%", I don't know if that's related to the font "Zero Twos 5" in the skin.py script (which means I have to install fonts-larabie-deco to provide that) I guess I'll need to experiment with some other fonts to see what happens. Edit, no, still an "x" with different fonts. Does anybody here know Python? Does anybody here know Python? I'm sure it's pretty easy to fix, I wonder if you need to escape the character so instead of "X" try "\%"
I can change %sx to %sn or other characters and the clock will use that, but not the % symbol or \%. Python must be interpreting that as a variable or something instead of part of the character string. Edit: It seems more related to how python-gtk, thus pango, is interpreting that command. Awesome, that worked! I'll revise those files and send up a new mx-clocky. I think it's stable enough to put in main. It seems the clocky python file has sections for displaying "net" and an alarm function, but no skins that I've found use those. 16.3.2 is in the main repo, with that % fix. * Set default state of applet window as sticky. * Replace broken Racing skin with Alien. mx-icon.svg graphic to docs for any future user that want to customize. So the MX icon graphic I used for the MX-Linux skin is in /usr/share/doc/mx-clocky if anyone wants to create more MX skins.